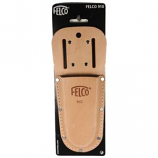 Provides a safe place to store a pruner or folding saw while it protects it from the elements. Molded tan leather sheath allows to clip it onto a belt. . . .